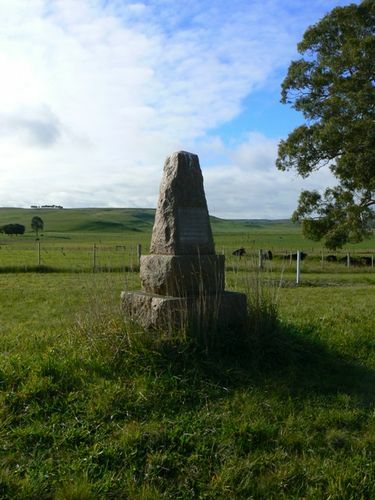 A cairn commemorates the expedition of Thomas Mitchell who crossed the Wannon River near this spot in 1836. CASTERTON, Sunday. — The crossing of the River Wannon near Casterton by the explorer Major Mitchell on August 11, 1836, while on the way from New South Wales to Portland, was celebrated yesterday afternoon by a public meeting, at which there were several residents of 60 years and more. The function was arranged by Councillor John Little, president of the shire of Glenelg, to mark the 80th anniversary and fix the spot temporarily until the time comes when a permanent monument shall be erected. On a growing tree on the bank have been carved the words "Major Mitchell crossed here, August 11, 1836." Argus (Melbourne, Vic), 14 August 1916. CASTERTON.— The memorial cairn to mark the crossing of the Wannon River by Major Mitchell has now been completed. The cairn, which is a most imposing structure, built of Casterton red granite, is to be unveiled at an early date. Age (Melbourne), 1 September 1930. Erected by Glenelg Shire Ratepayers 1930.